There’s a natural curiosity among karate practitioners to understand what we practice at the deepest levels. With kata, that understanding often turns to breaking down the pieces and parts of our forms to see just how many different ways a given series of movements can be adapted to an actual self-defense situation. That process of analysis is what we typically call bunkai. The term bunkai is composed of two kanji: bun (分) and kai (解). So the term bunkai can literally be translated to “a solution to the question of how things relate to one another.” Notice I said “a" solution - not “THE" solution. When looking at sequences in kata through the lens of bunkai, it’s pretty easy to see that there’s more than one “solution” to explaining the relationship between movements and postures. For most kata, there is an obvious solution and several more that are less obvious. The first two moves of Heian Shodan are a great example of this; we’re initially taught that these movements are a downward block to the left, followed by a forward stepping punch. Other ways of using the same combination of techniques are taught later. Over time, we start to see every sequence in kata as almost onion-like: always another layer to peel away and discover! #1 - Our version of the kata is pretty far removed from the original version. The seven core Shotokan kata (Kanku Dai, Bassai Dai, Enpi, Jion, Hangetsu, Gankaku, and Jitte) are all simplified versions of the earlier Okinawan kata that Funakoshi learned - and the versions he learned were also adapted and simplified from earlier Chinese forms! When we try to reverse engineer Shotokan kata, our first and biggest challenge is understanding how the movements were originally performed, and how far back into the original kata we want to go. There’s both good news and bad news about this. The bad news first. We’ll probably never know the actual intent behind the earliest versions of the kata when it comes to deeper layers of the onion. With every generation, performance elements change and the original movements - along with many of the hidden meanings - become further obscured. Now for the good news. Every generation has the opportunity to rediscover the various layers of meaning in the movements of the kata we currently practice. It actually doesn’t matter what the original intent for any particular sequence of moves might have been. What matters is our ability to control our movements precisely (when practicing the kata alone) and adapt those movements to various types of encounters as we do in bunkai. Just because our current Bassai Dai is different from the multiple versions practiced 100 years ago doesn’t mean that there aren’t an almost unlimited number of potential applications for the version of the kata we do practice. By studying older versions of the kata and training with people in other styles, we can get insights into how earlier interpretations have survived into our own generation. Okinawan styles of karate, Korean styles, and Chinese styles all have similar movements with their own “passed down” knowledge. Discovering good leads for effective bunkai for Shotokan kata is definitely not limited to Shotokan! Kata wa tadashiku, jissen wa betsu mono. This precept is one we usually just kind of acknowledge with a nod. “Yep, two different things entirely, got it…” But do we ever really dig into what was meant by this? Practicing kata is like learning a language - a language of conflict and resolution. As with any language, we can learn the words (kihon) and phrases (sequences in kata), but that doesn’t mean we’re ready for the debate team. The actual use of things we learn from kata, as with any language, requires a certain level of fluency and adaptability. Reciting a paragraph you’ve memorized in French doesn’t mean you’re ready for a fast-paced street corner conversation in Paris. Learning a kata - including many of the possible bunkai - does not mean you’re expertly prepared for actual combat. When we study bunkai, it’s usually in a very controlled “if somebody grabs your wrist you can do this” sort of way. It’s slow. It’s all predetermined. A great way to break out of this pattern is to adapt your practice of one-attack to include bunkai. Start with simple attacks - a Jodan level punch perhaps. In response to that punch, can you react with two sequences from each kata you’ve learned? One that’s obvious and one that’s a little more advanced? After you've moved through all of the pre-arranged attacks in basic ippon kumite (punches, kicks, grabs, even attacks with various types of weapons) you can move on to free one-attack, standing in front of an opponent without knowing ahead of time what they’re going to do. Can you still deliver an effective response based on the bunkai you’ve studied? Developing a high level of competent, natural fluency in your bunkai-based responses (as opposed to kihon-based responses) is an important step in really understanding Funakoshi’s 18th precept. If your bunkai only works for you when it's carefully set up and the attack is known ahead of time, it's not a realistic choice for self-defense (or as Funakoshi said, actual combat). When you can use the responses you've learned from studying bunkai as fluently and effortlessly as you can use a reverse punch or a rising block, then you're on the right track to understanding the 18th precept! #3 - Self-defense training depends on how intelligent and aggressive you let the attacker be. You’re only as good as the people who attack you in practice. The better skilled your attackers are, the better prepared you’ll be on the street. If you practice bunkai, you should certainly start out with slow and careful study. Over time however, you need to challenge your partners to attack you as they naturally might in a real situation. With control, of course, but in a naturally aggressive and predatory way. If you’re practicing against wrist grabs, collar grabs, and that sort of thing, there’s a common problem I see where the attacker fails to respond to your initial response. If I grabbed someone’s collar and they started putting some kind of hold on me, I’m going to try to let go and do something else. Wouldn’t you? If they reach out with both of their hands to secure one of mine, and they’ve left their head unprotected, I’m probably going to hit them with my free hand. If they stop after a single action - grab and pause, punch and pause, kick and pause - I can tell you this isn’t what will EVER happen in a real fight. If your bunkai requires the attacker to act in a way that’s unrealistic, by holding on longer than they really would or by failing to try to take advantage of other openings they might see, you’re only training yourself to defend against unskilled and unmotivated attackers. #4 - The clock is always ticking. Real attackers - not your drunk neighbor at the summer barbecue, but the real bad guys out there - rely on our reluctance to respond to an attack. Think about it. They’ve picked you to attack. They’ve watched you and decided when and how to initiate their attack. They waited until they were in a position where they felt they had an advantage. They chose their target, somewhere on your body. In all likelihood, they waited for a moment when you appeared to be unprepared to respond. Real attackers, violent criminals, aren’t practicing ippon kumite with you. It’s never just one attack. There’s a powerful moment of confusion for most people when they’re first attacked. What’s happening? Why is this happening? What’s going to happen next? In that moment, your attacker has probably hit you a second or third time. Your hesitation gave them that opportunity. And that hesitation is a natural consequence of being a decent human being who doesn’t walk around in a state of paranoia. But it’s the victim's reluctance to elevate their response that vicious attackers count on. They’re safe because they know you won’t want to immediately do what you’re capable of doing. While you’re trying to decide what level of response is needed, their attack continues. Every time you take a blow, your ability to respond at any level is diminished. By the time you realize an elevated response is really necessary, it might be too late. Why am I pointing all of this out? Some people, when practicing bunkai, come to believe that there are levels of response that one can progress through in an actual attack. “I’ll do this first, and then I can move on to this and then this if I need to…” Wrong. Deadly wrong. Multiple responses are great to know, but selecting the correct response MUST happen as soon as possible - instantly, in fact. That's what we train to do. There is no “progression of possible responses” if you’re a woman attacked in a parking garage. There’s no “I’ll do this first, then this…” if you’re facing multiple attackers. By the same token, if you’re in a situation where you know that people are definitely NOT trying to kill you, you don’t want to respond with anything potentially lethal. You have to know your situation and surroundings at all times, and, if necessary, you have to be ready to respond harder and faster than your attacker expects. You need to take the advantage as quickly and decisively as possible, knowing that the longer the conflict lasts the worse your odds of survival become. Don't let the study of bunkai fool you into thinking you'll have time to run through multiple options while someone is trying to beat your brains out. You have time to examine options in the dojo, not in the street. #5 - Ikken Hisatsu and Zanshin. Ikken hisatsu has a pretty ominous-sounding literal interpretation: “one punch, deadly blow.” Zanshin is a little nicer: “the remaining mind.” And they both strongly relate to the way we, as Shotokan stylists, should view the practice of bunkai. These two concepts are Japanese, from Japanese martial arts - primarily kenjutsu and later, kendo. They are distinctly not Okinawan concepts, and would only have been a part of Funakoshi’s early karate philosophy due to his understanding of kenjutsu. The Chinese martial arts from which most Okinawan karate evolved, primarily White Crane and Shaolin kung-fu, were based on the movements of animals. Multiple, rapid blows. Trapping, holding, and striking. Overcoming an opponent through the delivery and buildup of multiple attacks. In order for Funakoshi’s transmission of karate to Japanese society to be successful, he recognized that many aspects would have to be changed for acceptance. The characters used in the term karate changed from “China Hand” to “Empty Hand.” The names of kata changed. The format of practice changed. And most significantly, the underlying theory of combat itself changed, from a buildup of multiple attacks overwhelming an opponent to finishing (if possible) with a single blow. One of Funakoshi’s earliest sponsors and mentors in Japan was the legendary kendo teacher Nakayama Hakudo, who later instructed Funakoshi’s son and protege, Gigo Funakoshi, in the arts of iaido and kendo. The Shotokan we practice today - our kihon, our kata, and our kumite - is actually more reflective of Gigo Funakoshi’s technical approach that Gichin Funakoshi’s. Gigo’s understanding and adaptation of kendo and iaido philosophy to karate changed the foundation of our art completely. Although we still practice the kata that evolved from earlier Okinawan forms, our application of technique is fundamentally different than the way techniques were meant to be applied when those kata were created. Shotokan is an attack-oriented style. OK, OK, settle down there. That doesn’t mean we’re bullies or that we initiate conflict. It means that once we initiate our response to an attack, everything that we do in response becomes an attack. Our blocks are attacks. Our punches, kicks, and strikes are attacks. Anything else that exists in our practice that’s NOT an attack is only there to facilitate an attack. Kenjutsu, kendo, and iaido all share a similar theory of combat. If two swordsmen face one another, there is no defense. One swordsman will attack and kill the other. Or they will both attack and kill each other. There is no thought of survival - only attack. Now, we’re not swordsman who’ve pledged to die for our leader in combat. We’re certainly hoping and planning to survive an attack. But the way we practice our kihon is based on delivering an overwhelming blow to our opponent, whether that’s in the form of a block or a punch or a kick. This is what we train ourselves to do, even in the way we perform our kata when we’re NOT studying bunkai. The emphasis is on distance, timing, speed, power and focus. This is also why sport karate is considered by many instructors to be harmful to progress in serious karate-do. Kumite, particularly pre-arranged kumite like 5-, 3-, and 1-attack, builds our capabilities to deliver a finishing blow. Sport kumite and most forms of jiyu-kumite don’t allow us to focus as clearly on this concept. 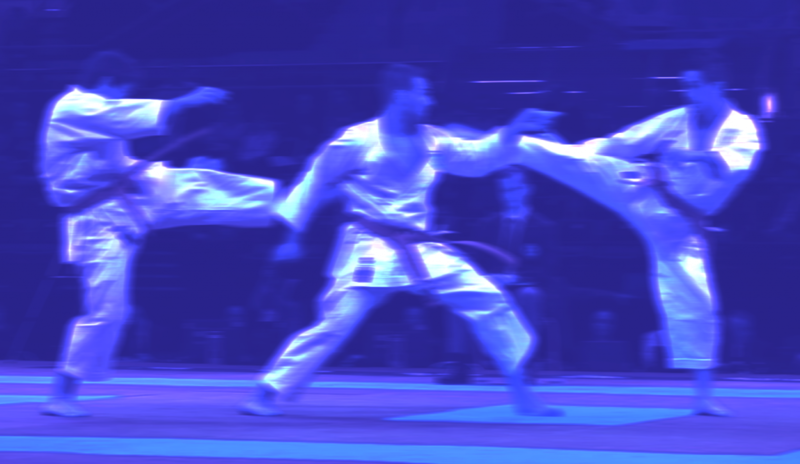 In tournaments, kumite points are awarded for “less than correct” techniques. Score enough waza-ari (half points) in your division and you can be a champion, even if not a single technique was capable of ikken-hisatsu. If a trophy or a gold medal is the goal, you can get there without showing any true mastery of karate-do. We’re fooling ourselves. When we practice bunkai, looking for responses that our practice no longer really supports, we’re fooling ourselves in a different way to some extent. Our practice of kihon, kata and yakusoku (prearranged) kumite is based on developing the ability to stop a fight with one blow, and then remaining aware of our opponent (zanshin) from a safe position to make sure there’s no longer an intent or capability for them to attack us again. This is what we practice. This is what we try to get good at in Shotokan. Attempting to go back and dissect Shotokan kata for sequences that rely on grappling, throwing, and other such responses is interesting, but we can’t fool ourselves into thinking that a lifetime training in one theory of combat will make us skilled in a completely different theory of combat. If you were a world class opera singer, you probably wouldn’t pick a rap song to perform on America’s Got Talent. You’d know what you’re good at and you’d stick with what you know, right? If you’re in a situation that requires you to physically defend yourself, remember that your immediate, instantaneous response should be chosen from what you’ve trained most frequently to perform. For almost all Shotokan stylists, that's going to be the simple, uncomplicated, fast, and powerful kihon that you’ve practiced since day one, not necessarily the interesting but overly complicated “sequences from kata” that make up the bunkai training we tend to do on the side. Most of us have spent hundreds of hours working on strong basic punches, blocks and kicks for every one hour we've spent studying bunkai-based grappling and joint locks. Under the pressure of a real attack, you need to rely on what you know best without any hesitation or confusion. If you do in fact want to become an expert in the original bunkai of our Okinawan-based kata, just realize that you’re going to need to invest as much time in the study of those arts as you have in Shotokan, and that you’re probably going to want to find a qualified instructor in Goju-ryu or Shorin-ryu to help guide you. I realize that this last section might seem to discourage the study of bunkai, but I do have some more good news for you. The sequences in the kata that we disassemble and study are up to US to interpret. There’s absolutely no reason why we can’t adapt any sequence of movements to follow the principles of ikken-hisatsu and zanshin! There are a lot of layers to the onion, and we just have to find the layers that work best for us. By keeping this last thought in mind, we have the opportunity to make things that we discover through the study of bunkai fit into the Shotokan theory of combat that we've spent most of our time mastering, regardless of our individual age, size, or strength.